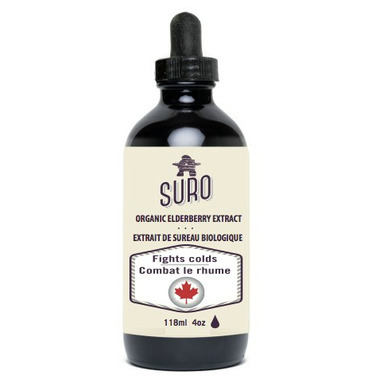 Suro Elderberry Extract is made with Canadian elderberries by grower and manufacturer SURO. Great anti-viral ally to help prevent off colds and flu. Elderberry efficacy has been compared to Tamiflu against H1N1. Keeps immune system strong year long and is often used by travelers to foreign countries because of numerous studies showing elderberry efficacy against many strains of influenza and easy portable with drop dispenser. Traditionally used to help fight colds, sore throat, cough and fever. Dosage: 20 drops in water, 3 times per day.